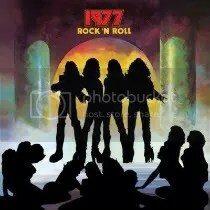 In the proud tradition of “inspired by” type bands such as Spinal Tap, Skrapp Mettle, Steel Panther and Loudlion comes 1977! Okay, most of those bands I mentioned were/are going for satire & self-deprecating humor, but they still came amazingly close to the sounds of the bands they were based on. While Spinal Tap was satire and Skrapp Mettle was some sort of mean joke, it’s not hard to get the feeling 1977’s attempts to be KISS are done with hearts full of love and respect. Are the lyrics silly at times? Yes, but so are KISS’, so I take it as just being another part of the act. I was made aware of this band thanks to Steve at Heavy Metal Addiction. I hopped over to 1977’s MySpace page to hear a few samples and really liked it a lot. I promptly placed an order for the CD at CDBaby.com, and just days later, here the album sits playing in my computer. Ah, the digital age! Where would we be without the internet to sample and order music? I’ve been listening to this album a lot over the past few days. From the logos (right down to using the old Casablanca Records logo! ), fonts, album cover (Love Gun) and Gene, Paul & Ace voices… Everything is in place. The album even includes a 1977 sticker like KISS albums used to do! All of this adds up to a neat little package where the CD is a mini-album replica (No jewel case, here it’s an album sleeve!) and the CD is made up to look like a vinyl record… Even on the bottom! I love it. Let’s get to the music. This isn’t a cover band, but the songs are very similar sounding to KISS tunes: “Gladiator” = “God of Thunder”, “She Wants It All” = “Do You Love Me”, “Love At First Kiss” = “Love Gun”, “Blast Off” is the greatest song Ace never wrote/sung and “Straight To The Heart” starts off like “Black Diamond” and then morphs a bit into a “Calling Dr. Love” clone. You don’t feel cheated though when you’re able to pick out the similarities, these songs have enough of their own identity (well, enough that you possibly can when you’re purposely trying to capture another band’s sound) to stay fresh. It’s funny, Paul & Gene have stated the upcoming KISS album is going feature a “70s KISS sound”, but 1977 already beat’em to it! My only complaint… Where’s the “Beth” knockoff? Oh well. Rock ‘N Roll is a great release and it should be a treat for all KISS fans. By the way, no band member credits because in true KISS fashion, the band wishes to remain a mystery!